Please help me welcome author Danica Winters to Full Moon Bites! Today she is talking about Relating to Characters. I love paranormal romance and lately I have been dissecting every romance novel I can get my hands on, all in an attempt to find out what makes some Great and others, well, not to so great. One of the most important things I have found is that characters in any novel must be relatable. If I can connect with a character, I will fall in love with the book and keep reading. If not, I have to admit I put the book down. I’m infamous for not finishing books (Hello, 50 Shades…) because of the writer’s inability to create characters I can connect with. One of the best things about being an author as well as an avid reader is the fact that I get to read and write and call it work. I have the opportunity to tune into great characters and be in their life for a least a few hours or days. I will never be a Veela (like my seductresses in my novels, Curse of the Wolf and Secrets of the Labyrinth). Yet, as I write I get to live their gripping, mysterious, and dangerous lives for the months that I am working on the novel. It’s an amazing process. In a way, I get to become these characters, I relate to them and then transfer my feelings and insights into the novels. I am currently working on my third Veela novel where the main seductress can shape-shift into a palomino Mustang. Just like my two Veelas before (Gloriana and Adriane) I find this woman to be close to my heart. Like all of my female characters, she’s funny, a little hardheaded, and is a woman who will stand her ground against a man. One of my all-time favorite characters (that I didn’t create) has to be Bridget Jones. I’ve read the books and watched the movies and each time it’s easy to fall into the open arms of great fiction. I am instantly Bridget, feeling ridiculous, doing asinine things—because that character is a reflection of how I feel about myself. In my professional life I like to think that this air of silliness doesn’t follow me. However, just like Bridget Jones, I tend to walk around with my knickers hanging out. In fact, just last week I started my hair dryer on fire while at a Writers Conference. It’s hard to walk into a book signing event without laughing when you smell like smoke and your hair is a wet mess. At least I have great fans that love my characters as much as Bridget Jones and who can support this somewhat crazy lady! What fictional characters can you relate to? Danica Winters is an Amazon best-selling romance author based in Montana. She is known for writing award-winning books that grip readers with their ability to drive emotion through suspense and often a touch of magic. She is a member of Romance Writers of America, Montana Romance Writers, and Greater Seattle Romance Writers. She is a contributor to magazines, websites, and news organizations. She enjoys spending time with friends and family, the outdoors, and the feel of a great book in her hands. 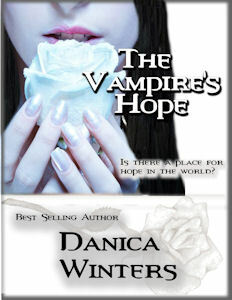 ﻿Danica is taking her book ﻿﻿﻿﻿﻿The Vampire's Hope with us starting on Nov. 1st! :) You can click the banner below for the tour schedule.